Tag line: "...Is it just your imagination or your Sanity that's in question?" Director Freddie Francis was no stranger to horror anthologies, having helmed Dr. Terror’s House of Horrors in 1965, Torture Garden in 1968 and Tales from the Crypt in 1972. 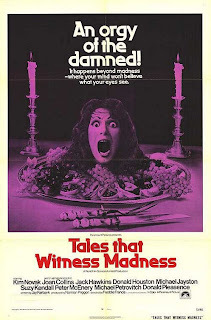 Yet even with Francis' experience in this particular arena, his 1973 movie, Tales That Witness Madness, is ultimately a mixed bag. Noted psychiatrist R.C. Tremayne (Donald Pleasance) is giving good friend Dr. Nicholas (Jack Hawkins) a tour of his facility. Using advanced methods, Tremayne has been treating a variety of patients, including Paul (Russell Lewis), an adolescent boy whose parents (Donald Houston and Georgia Brown) worried when he started spending his days with an imaginary playmate named "Mr. Tiger". Another patient, named Timothy (Peter McEnery), claims to have visited the 19th century on what he says was a haunted bicycle, which once belonged to his Uncle Albert (Frank Forsyth). Rounding out the collection of oddballs is a man (Michael Jayston) who fell in love with a tree branch, thus making his wife (Joan Collins) green with envy, and Auriol (Kim Novak), whose daughter (Mary Tamm) was seduced by a business associate (Michael Petrovich) attempting to remove a curse placed on his family, one that could only be destroyed by the consumption of human flesh. As is the case with most anthologies, some of the stories in Tales That Witness Madness are stronger than others. The 1st segment, titled Mr. Tiger, seems straight-forward enough, with young Paul creating a fictitious pet to help him deal with his parent’s constant bickering. But then, how to explain the muddy paw prints, and huge scratches that mysteriously appear on several doors? While predictable, Mr. Tiger ends strongly, and with plenty of blood. Penny Farthing combines period romance with the strange story of Uncle Albert, whose charred, rotting corpse stalks Timothy whenever he rides the antique bicycle into the past. An engaging mystery, Penny Farthing is easily the strongest tale in Tales That Witness Madness, and by a wide margin. Despite the presence of the lovely Joan Collins, Mel, about a man obsessed with a tree branch, is fairly silly, and Luau plays out at a methodical pace, featuring a so-so performance by Kim Novak and a plot that doesn’t break any new ground. 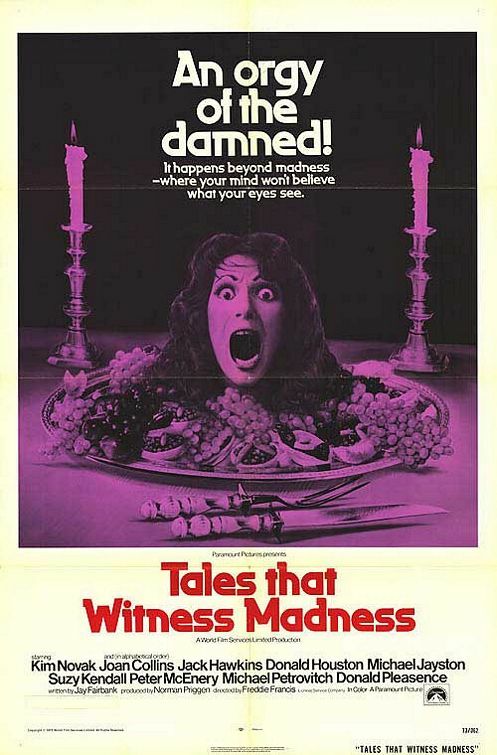 Though it comes up short from time to time, even the weakest entry in Tales That Witness Madness boasts an interesting premise, and while the film certainly won’t set your world on fire, it will, undoubtedly, keep you entertained.